Food was hunted down, hauled from the water, gathered from the forests or plucked from shallow waterways. Farming wasn't an option because of sparse soil and the cold climate. The collection and processing of the food used up most of the day. The men only had access to primitive tools...bows and arrows, spears, clubs, snares and their wits...to hunt down and kill animals that were often been many times stronger, faster and more powerful than themselves. When Hollywood referred to native American men as 'braves', they weren't off the mark. The milder climate and better soil conditions below the Great Lakes made subsistence farming possible. Because the crops had to be tended families tended to gather together in small villages rather than divide up in migratory family groups. Women were responsible for the farming and food production although men helped clear space in the forest for planting. Hunting, fishing and foraging were still part of the daily routine but the diet was expanded to include vegetable like corn and squash. Success depended on how well the hunter knew his prey - its habits, its tracks and its ability to defend itself. He had to make judgements about the most likely way of making a kill how to approach close enough without being detected and he had to be silent, very fast, very powerful and very accurate. Not a job for your average computer geek. With luck a single man could bring down a large animal, but it was more effective for small bands of men to track down, surround an animal and move in for the kill together so that avenues of escape were limited. Certain amount of safety in numbers, too. Knowing an animal's habits allowed for another technique - the covered pit trap. Simply put a large deep hole was dug, covered and camouflaged and baited with the remains of a carcass. When the bear or cat came for the free lunch and fell into the hole it could be dispatched with spears and arrows from the safety of the edge of the pit. Snares were used on smaller animals. Made from sinew or strips of braided tree root there was little danger to the hunter. The skill needed was in knowing where to set the snare. In areas of reasonably temperate climate, some Ojibwa food was grown in small garden plots. Southern tribes learned to grow squash, gourds and corn and the practice made its way at least as far north as the Illinois area. Corn was originally domesticated in Mexico but became an important part of the southern Woodlands Indian diet about 1300 years ago. 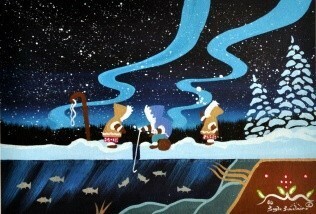 The northern Ojibwa, of course, couldn't grow corn or any other crop. At the time the continent was very heavily forested and if a suitable garden plot wasn't available it had to be created. It was possible to use a controlled fire to fell a single tree, but another method was to strip bark from several neighboring trees so that when they died sunlight could filter through to the forest floor. Other plants were domesticated and made their way into the ojibwa food basket. Many of those plants are considered weeds today. . . goosefoot, marsh elder, little barley and may grass, but that's because you guys don't know how to use them! Although it was used for ceremonial purposes, not food, it's interesting to note that native people domesticated tobacco more than 2000 years ago. Besides the old tried and true method of baiting a hook and lowering lunch into the water for the little fishies, in shallow waters it was possible to spear the fish. In narrow streams a hand made net could gather in more than one fish at a time. Elongated woven baskets attached to a pole were also used to scoop fish out of the water. Ojibwa food also included mussels, turtles, crayfish and frogs and if you check out Gayle's painting you'll notice that there's a beaver house in the bottom right corner. 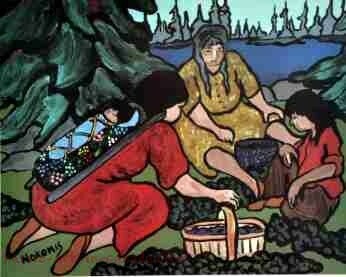 Nokomis - "Picking Berries in August"
Other Ojibwa food was just there for the taking. Grapes, sumac berries, blackberries, raspberries, strawberries, chokecherries, blueberries and plums could be found from one end of the territory to the other. So could bulrush. The bulbous root, the white stalk that grows under the water and even the brown seed head are edible (but harvest the seed head early in the summer before it goes to seed). There's twelve times more vitamin C in a bulrush plant than there is in a single orange! And there are various kinds of lichen that are edible. 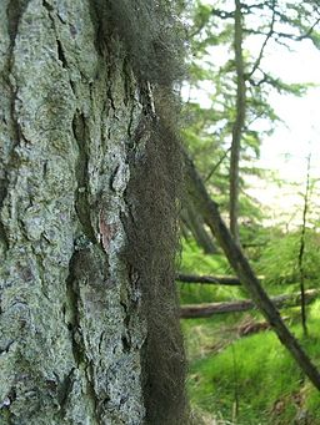 There's a black lichen that grows on trees . . . my ever so educated friend says its bryoria fuscescens for those of you who really want to know . . . that can be cooked slowly in a pit or steamed if you don't want to go that route. It hardens up, looks wicked but tastes sort of like licorice. Persimmons, groundnuts, hazelnuts and various other edibles were only found in the warmer parts of the territory.But then again some foods like wild rice and maple syrup were only available in the cooler climate.